"The Flood" redirects here. For other uses, see Flood (disambiguation). The Genesis flood narrative makes up chapters 6–9 in the Book of Genesis, in the Bible. As one of many flood myths found in human cultures, the narrative recounts God's intent to return the Earth to its pre-creation state of watery chaos by flooding the Earth because of humanity's misdeeds and then remake it using the microcosm of Noah's ark. Thus, the flood was a reversal of creation. The narrative discusses the evil of mankind that moved God to destroy the world by the way of the flood, the preparation of the ark for certain animals, Noah, and his family, and God's guarantee (the Noahic Covenant) for the continued existence of life under the promise that he would never send another such flood. Although many religious groups consider the story to be largely allegorical, there are still many groups and individuals who believe the story to be literally true. Since at least the 19th century, scholarly consensus has been, and evidence from scientific investigation has shown, that the story cannot be literally true, and among scholars it is categorized along with other flood myths as a legend. Genesis 6:1–4 presents the reason for the flood: the Sons of God marry the daughters of men and sire a race of giants, "mighty men which [were] of old, men of renown". Genesis continues: "And GOD saw that the wickedness of man [was] great in the earth, and [that] every imagination of the thoughts of his heart [was] only evil continually." (Genesis 6:5) God decides to destroy the world in a reversal of creation. The flood occurs because God judges humanity. In Genesis 6:5-8, the LORD judged "man" for being wicked and evil. In verses Genesis 6:11-22, God judged "all flesh" for being corrupt and violent. The judgment in verses 6:5–8 is thought to have been written earlier and later combined with the second. This element of judgment makes the flood story different from the flood in the Babylonian Epic of Gilgamesh. In the Gilgamesh story, the flood is mentioned only in passing as part of the Epic tale itself, and appears to have been the result of polytheistic caprice, not the supreme God's moral judgment. However, in the Atrahasis version of the Babylonian flood story (which deals directly with the flood), it is made clear that the flood was sent by the gods to reduce human over-population, and after the flood other measures were introduced to prevent the problem recurring. The Priestly source, Genesis 7:11;8:1-2, describes the nature of the flood waters as a cosmic cataclysm, by the opening of the springs of the deep and the floodgates, or windows, of heaven. This is the reverse of the separation of the waters recounted in the Genesis creation narrative of chapter 1. After Noah and the remnant of animals were secured, the fountains of the great deep and the floodgates, or windows, of the heavens were opened, causing rain to fall on the Earth for 40 days. The waters elevated, with the summits of the highest mountains under 15 cubits (22 feet 6 inches) of water, flooding the world for 150 days, and then receding in 220 days. God makes a pledge of commitment to Noah in Genesis 9:1–17. The priestly (Elohim) version takes the form of a covenant arrangement. This is the first explicit act of a covenant in the Hebrew Bible and is used seven times in this episode. God commits to continue both human and animal life and vows to never again use a deluge against humanity. The covenant is sealed with the sign of a rainbow, after a storm, as a reminder. God blesses Noah and his sons using the same language as the priestly source of the Genesis creation narrative: "Be fruitful and increase and fill the earth." Before the flood, animals and humans coexisted in a realm of peace only knowing a vegetarian diet. After the flood, God maintained that mankind would be in charge over the animals, granting that they may be eaten for food under the condition that their blood be removed. God set these purity rules well before any transaction with Ancient Israel, effectively not confining such precedence solely to the Jewish faith. Human life receives special divine sanction because humanity is in the image of Elohim. Many exegetes believe that the Genesis narrative is a composite of two different stories that were combined into the final canonical form of Genesis 6–9. :22;:19 Some scholars call these the Jahwist (JHWH) source and the Priestly (Elohim) source. Some notable difficulties between the two sources include: two different reasons are given for why the flood happens, Noah is given two different instructions about what animals and birds to take on board the ark, there are two different time frames given for how long the flood lasts, there are different explanations of the "nature of the flood waters", different circumstances by which Noah and the animals leave the ark, and two different "divine names" (elohim and Yahweh) are used. Other scholars, while noting the differences in characteristic style and vocabulary, argue that overall they are not contradictory. Where apparent contradictions do exist, they are not typically viewed as mistakes by Jewish scholars, but rather as allusions to deeper meanings. Even later interpreters have sought to discover the basic harmony that underlies the narrative, whether written by different authors, at different times, or within different cultures. 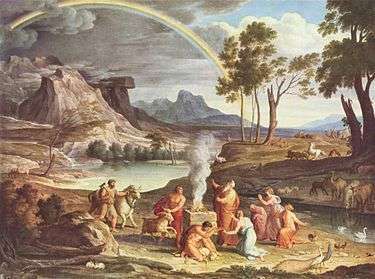 The Genesis flood narrative is similar to several other ancient myths. Many scholars believe that the Noah story and the biblical flood story are derived from the Mesopotamian versions,:21:20 because the biblical myth is similar to far older Mesopotamian stories of a great flood, and that some of the early Hebrews lived in Mesopotamia, for example during the Babylonian captivity. The earliest written flood myth is the Sumerian flood myth found in the 'Epic of Ziusudra’. Earlier and very similar Mesopotamian flood stories are found in the Epic of Gilgamesh and the Epic of Atrahasis texts. In the Atrahasis version, the flood is described as a "river" flood and dead bodies floated to the "riverbank". The Quran states that Noah (Nūḥ) was inspired by God, believed in the oneness of God, and preached Islam. God commanded Noah to build an ark. As he was building it, the chieftains passed him and mocked him. Upon its completion, the ark was loaded with the animals in Noah's care as well as his immediate household. The people who denied the message of Noah, including one of his own sons, drowned. The final resting place of the ark was referred to as Mount Judi. According to the Yazidi Mishefa Reş, two flood events occurred. The first flood involved Noah and his family, whose ark landed at a place called Ain Sifni in the region of Nineveh Plains, 40 kilometres (25 mi) north-east of Mosul. In the second flood, the Yazidi race was preserved in the person of Na'mi (or Na'umi), surnamed Malik Miran, who became the second founder of their race. His ark was pierced by a rock as it floated above Mount Sinjar, but settled in the same location as it is in Islamic tradition, Mount Judi. While some scholars have offered possible explanations for the origins of the flood myth including a legendary retelling of a possible Black Sea deluge, the general mythological exaggeration and implausibility of the story are widely recognized by relevant academic fields. The acknowledgement of this follows closely the development of understanding of the natural history and especially the geology and paleontology of the planet. The Masoretic Text of the Torah places the Great Deluge 1,656 years after Creation, or 1656 AM (Anno Mundi, "Year of the World"). Many attempts have been made to place this time-span to a specific date in history. 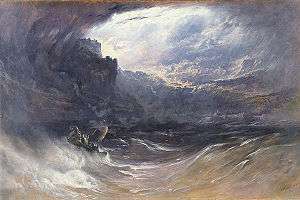 At the turn of the 17th century, Joseph Scaliger placed Creation at 3950 BC, Petavius calculated 3982 BC, and according to James Ussher's Ussher chronology, Creation took place in 4004 BC, dating the Great Deluge to 2348 BC. The development of scientific geology had a profound impact on attitudes towards the biblical flood narrative. Without the support of the biblical chronology, which placed the Creation and the Flood in a history which stretched back no more than a few thousand years, the historicity of the ark itself was undermined. In 1823, the English theologian and natural scientist, William Buckland, interpreted geological phenomena as Reliquiae Diluvianae: relics of the flood which "attested the action of a universal deluge". His views were supported by others at the time, including the influential Adam Sedgwick, but by 1830 Sedgwick considered that the evidence only showed local floods. The deposits were subsequently explained by Louis Agassiz as the results of glaciation. In 1862, William Thompson, later Lord Kelvin, calculated the age of the Earth at between 24 million and 400 million years, and for the remainder of the 19th century, discussion focused not on whether this theory of deep time was viable, but on the derivation of a more precise figure for the age of the Earth. Lux Mundi, an 1889 volume of theological essays which is usually held to mark a stage in the acceptance of a more critical approach to scripture, took the stance that the gospels could be relied upon as completely historical, but that the earlier chapters of Genesis should not be taken literally. By a variety of independent means, scientist have determined that the Earth is approximately 4.54 billion years old. The scientific community considers flood geology to be pseudoscience because it contradicts the scientific consensus in geology, stratigraphy, geophysics, physics, paleontology, biology, anthropology, and archeology. Modern geology, its sub-disciplines and other scientific disciplines utilize the scientific method to analyze the geology of the earth. The key tenets of flood geology are refuted by scientific analysis and do not have any standing in the scientific community. Modern geology relies on a number of established principles, one of the most important of which is Charles Lyell's principle of uniformitarianism. In relation to geological forces it states that the shaping of the Earth has occurred by means of mostly slow-acting forces that can be seen in operation today. In general, there is a lack of any evidence for any of the above effects proposed by flood geologists and their claims of fossil layering are not taken seriously by scientists. This engraving, made from carved sardonyx and gold, features a line of animals on the gangway to Noah's ark. It is based on a woodcut by the French illustrator Bernard Salomon. The Walters Art Museum. In Europe, the Renaissance saw much speculation on the nature of the ark that might have seemed familiar to early theologians such as Origen and Augustine. At the same time, however, a new class of scholarship arose, one which, while never questioning the literal truth of the ark story, began to speculate on the practical workings of Noah's vessel from within a purely naturalistic framework. In the 15th century, Alfonso Tostada gave a detailed account of the logistics of the ark, down to arrangements for the disposal of dung and the circulation of fresh air. The 16th-century geometer Johannes Buteo calculated the ship's internal dimensions, allowing room for Noah's grinding mills and smokeless ovens, a model widely adopted by other commentators. Various editions of the Encyclopædia Britannica reflect the collapse of belief in the historicity of the ark in the face of advancing scientific knowledge. Its 1771 edition offered the following as scientific evidence for the ark's size and capacity: "...Buteo and Kircher have proved geometrically that, taking the cubit of a foot and a half, the ark was abundantly sufficient for all the animals supposed to be lodged in it. ...the number of species of animals will be found much less than is generally imagined, not amounting to a hundred species of quadrupeds...". By the eighth edition (1853–1860), the encyclopedia said of the Noah story, "The insuperable difficulties connected with the belief that all the existing species of animals were provided for in the ark, are obviated by adopting the suggestion of Bishop Stillingfleet, approved by Matthew Poole...and others, that the Deluge did not extend beyond the region of the Earth then inhabited...". By the ninth edition, in 1875, no attempt was made to reconcile the Noah story with scientific fact, and it was presented without comment. In the 1910 edition, the article on the ark stated that "Before the days of 'higher criticism' and the rise of the modern scientific views as to the origin of species, there was much discussion among the learned, and many ingenious and curious theories were advanced, as to the number of animals..." on the ark. By the 17th century believers in the Genesis account faced the issue of reconciling the exploration of the New World and increased awareness of the global distribution of species with the older scenario whereby all life had sprung from a single point of origin on the slopes of Mount Ararat. The obvious answer involved mankind spreading over the continents following the destruction of the Tower of Babel and taking animals along, yet some of the results seemed peculiar. In 1646 Sir Thomas Browne wondered why the natives of North America had taken rattlesnakes with them, but not horses: "How America abounded with Beasts of prey and noxious Animals, yet contained not in that necessary Creature, a Horse, is very strange". Browne, among the first to question the notion of spontaneous generation, was a medical doctor and amateur scientist making this observation in passing. However, biblical scholars of the time, such as Justus Lipsius (1547–1606) and Athanasius Kircher (c.1601–80), had also begun to subject the Ark story to rigorous scrutiny as they attempted to harmonize the biblical account with the growing body of natural historical knowledge. The resulting hypotheses provided an important impetus to the study of the geographical distribution of plants and animals, and indirectly spurred the emergence of biogeography in the 18th century. Natural historians began to draw connections between climates and the animals and plants adapted to them. One influential theory held that the biblical Ararat was striped with varying climatic zones, and as climate changed, the associated animals moved as well, eventually spreading to repopulate the globe. There was also the problem of an ever-expanding number of known species: for Kircher and earlier natural historians, there was little problem finding room for all known animal species in the ark. Less than a century later, discoveries of new species made it increasingly difficult to justify a literal interpretation for the Ark story. By the middle of the 18th century only a few natural historians accepted a literal interpretation of the narrative. ↑ Silverman, Jason (2013). Opening Heaven's Floodgates: The Genesis Flood Narrative, Its Context, and Reception. Gorgias Press. 1 2 3 4 Levenson, Jon D. (2004). "Genesis: introduction and annotations". In Berlin, Adele; Brettler, Marc Zvi. The Jewish Study Bible. Oxford University Press. ISBN 9780195297515. ↑ Graves, Robert; Patai, Raphael (2014). Hebrew Myths: The Book of Genesis. RosettaBooks. p. PT92. ISBN 978-0795337154. ↑ Schwartz, Howard; Loebel-Fried, Caren; Ginsburg, Elliot K. (2004). Tree of Souls: The Mythology of Judaism. Oxford University Press. p. 447. ISBN 978-0195358704. 1 2 Bandstra 2009, p. 61. ↑ Cotter 2003, p. 49, 50. 1 2 3 4 5 Hugh Chisholm (1910). "Ark". The Encyclopedia Britannica: A Dictionary of Arts, Sciences, Literature and General Information, Volume 2 (11th ed.). Encyclopedia Britannica Company. p. 549. ↑ Young 1995, p. History of the Collapse of "Flood Geology" and a Young Earth. ↑ Ginzberg, Louis, 1909. The Legends of the Jews, vol. 1, pp. 145-169, Jewish Publication Society of America, Philadelphia. Reprinted as "Noah and the Flood in Jewish legend" in: Dundes, Alan (ed. ), 1988. The Flood Myth, University of California Press, Berkeley and London, pp. 319-336. ↑ Bandstra 2009, p. 59, 60. 1 2 3 4 May, Herbert G. and Bruce M. Metzger. The New Oxford Annotated Bible with the Apocrypha. 1977. 1 2 Bandstra 2009, p. 62. 1 2 Bandstra 2009, p. 65. ↑ Bandstra 2009, p. 65, 66. ↑ Blenkinsopp 2004, p. 45. 1 2 Cotter 2003, p. 50. 1 2 Cline, Eric H. (2007). From Eden to Exile: Unraveling Mysteries of the Bible. National Geographic. ISBN 978-1-4262-0084-7. ↑ Fant, Clyde E.; Reddish, Mitchell Glenn (2008). Lost Treasures of the Bible: Understanding the Bible Through Archaeological Artifacts in World Museums. Wm. B. Eerdmans Publishing. pp. 21–. ISBN 9780802828811. Retrieved 6 April 2014. ↑ W.G. Lambert and A.R. Millard, "Atrahasis: The Babylonian Story of the Flood", (Oxford, Clarendon Press, 1969), English translation of Atrahasis III,iv lines 7-9. ↑ Bulletin of the School of Oriental Studies, London Institution, Volume 2. University of London: School of Oriental Studies. 1921. ↑ Timeline for the Flood. AiG, 9 March 2012. Retrieved 2012-04-24. ↑ Davis A. Young, Ralph F. Stearley, The Bible, Rocks, and Time: Geological Evidence for the Age of the Earth, p. 45. ↑ Herbert, Sandra (1991). "Charles Darwin as a prospective geological author". British Journal for the History of Science (24). pp. 171–174. Retrieved 2009-07-24. ↑ James Barr (4 March 1987). Biblical Chronology, Fact or Fiction? (PDF). The Ethel M. Wood Lecture 1987. University of London. p. 17. ISBN 978-0718708641. Retrieved 2010-08-08. ↑ Isaak, Mark. The Counter-Creationism Handbook. Berkeley: University of California Press, 2007. ↑ Senter, Phil. "The Defeat of Flood Geology by Flood Geology." Reports of the National Center for Science Education 31:3 (May–June 2011). Printed electronically by California State University, Northridge. Retrieved 7 June 2014. ↑ Isaak 2007, p. 173. ↑ Stewart 2010, p. 123. ↑ "Cameo with Noah's Ark". The Walters Art Museum. Hamilton, Victor P (1990). The book of Genesis: chapters 1–17. Eerdmans. Kessler, Martin; Deurloo, Karel Adriaan (2004). A commentary on Genesis: the book of beginnings. Paulist Press. McKeown, James (2008). Genesis. Eerdmans. Rogerson, John William (1991). Genesis 1–11. T&T Clark. Towner, Wayne Sibley (2001). Genesis. Westminster John Knox Press. Wenham, Gordon (2003). "Genesis". In James D. G. Dunn, John William Rogerson. Eerdmans Bible Commentary. Eerdmans. Whybray, R.N (2001). "Genesis". In John Barton. Oxford Bible Commentary. Oxford University Press.